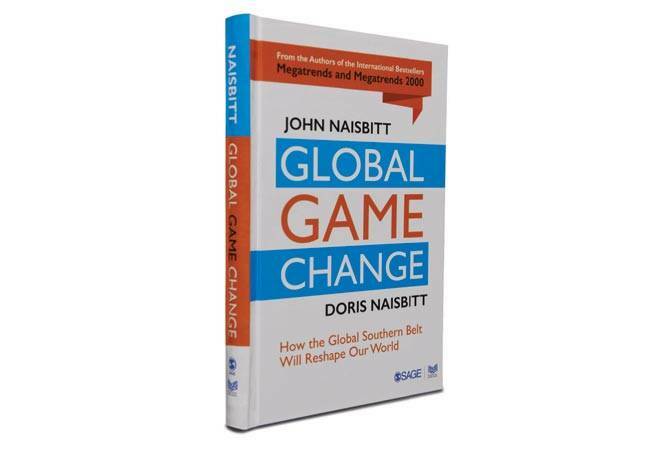 The book hails the countries of the Global Southern Belt as game changers that will challenge the Western worldview and reshape the world. I picked this book out of curiosity. Obviously, if experts have conducted an in-depth investigation on the region where my work is predominantly based, and are elaborating on facts that point a shift in the influencers of world economies, I want to know more. I absorbed the finer details and dwelled on what was being said. Here are my thoughts on the book. The authors with prolific backgrounds - Doris Naisbitt is the Director of Naisbitt China Institute, President of the John Naisbitt University, Belgrade, and head of the Austrian publishing house Signum Verlag; and John Naisbitt is a former secretary of education to President John F. Kennedy and special assistant to President Lyndon Johnson - talk about a large-scale global shift in geo-political and economic power over the last decade. The book examines major movements in authority from Western-centric countries in Europe and North America to the emergence of a 'Global Southern Belt' (GSB), with Asia leading the way. The book goes on to illustrate how each region shares common factors such as overall frustration with the current political scenario, social and economic conditions, a strong hunger for change and a yearning for growth. China, India, Africa, and Latin America have propelled themselves and pushed beyond expectations to raise their respective GDP and per capita income in the recent past. The desire for higher growth, larger turnovers, more jobs, better infrastructure, and facilities is predominant across these geographies. The burgeoning middle class there can be characterised as confident, literate, internet-savvy, focused and ambitious. They do not want to be under the dominance of the West, but create their own 'developed world' culture and identity. This book proficiently expands on the transformation of emerging economies around the world - private home restaurants in Cuba, strikes by hotel employees in Cambodia, and the new entrepreneurial spirit of South Africa. The book delves into investigating China's turnaround, India's new growth story, and the potential outcome of their partnerships. Since 1978, China shifted focus from an ideologically driven country to a result-driven one. Opening up of the economy by Deng Xiaoping was the game changer. They took a revolutionary step in making private sector (in a communist regime) the key employer and a major contributor to drive growth and create wealth, thus influencing overall success. China is likely to assume a larger role as the 'global middle kingdom'. After being included in the WTO in 2001, China became a force to be reckoned with. From 2005 to mid-2013, China's overseas global investment was $688 billion. The biggest chunk of this went to the GSB countries. As the world's third largest investor, it has been consciously working towards supporting developing countries to help them detach themselves from Western dependence. This nation is setting the pace for development in every field of globalisation in the future. While the world acknowledges that China has come a long way, its current GDP growth is 6.7 per cent and the per capita income of $6,416.18 clearly shows just how driven it is towards becoming a superpower. As of this year, its current total investment in the GSB is $499 billion. China has the largest scale of urbanisation in history. By 2030, nine Chinese cities will join the world's biggest municipal economies while eight in Europe will be dropped. China's strong presence in Africa, Latin America and, recently, Arctic and Antarctica, displays a serious long-term strategy to be the key world player. What was very interesting to learn is that China is taking keen interest in the Arctic region and Antarctica, places that most countries are ignoring. With five research stations already running in Antarctica, China's geopolitical role is being set now, for the future. In 2048, the Antarctica treaty is up for review. The continent's oil reserves are estimated to be up to 203 million barrels (the largest in the world). This means China is increasing its presence in the region to win favourable position in time for 2048. While I acknowledge the experts' forecast that this progressive country is well on its way to overtaking continents like America and Europe, I differ with their outlook on India's growth story. As an Indian businessman, I have witnessed our game-changer, the opening up of the Indian economy in 1991. Indian economy is now eight times bigger than what it was in 1991 (in dollar terms). From GDP growth of 1.1 per cent, the Indian economy is growing at 7.6 per cent now. Statistics are incredible. Passenger cars sold annually have gone up from 0.18 million to 2.7 million, similarly air passenger traffic has gone up from 10 million to 100 million. The Indian middle-class has never had it so good. However, I concur that there is a dire need to address issues such as corruption, Parliament log-jams and competitive politics to realise its real "tryst with destiny". The 'two big Es: Economics & Education' in India have undergone a major transformation in recent times, leaving our nation with optimism. The environment is conducive for start-ups to flourish today; young IT entrepreneurs are helping millions out of poverty through mobile-based apps and other technologies. It is a time for social responsibility to go hand-in-hand with business ideas. India's business community is upbeat about the ruling party's approach of enabling the enablers. India is one of the beacons of hope in an otherwise fragile economic world. We are already witnessing large infrastructure and other projects leading to greater partnership amongst these two nations. As their roads converge, this partnership will have a force multiplier in making GSB the dominant influencer. As the book states, "In the coming decades, China and India will be on a twin path of cooperation and competition, aiming to improve trade and investments. India's urgent need to improve infrastructure and manufacturing meets China's goal of investing $100 billion in the next five years in India." Overall, this is a very insightful book, with thought provoking evidences. It is an excellent source to know what is going on in the 'Southern Belt' of the world. These two economic minds have meticulously redefined the macro picture.